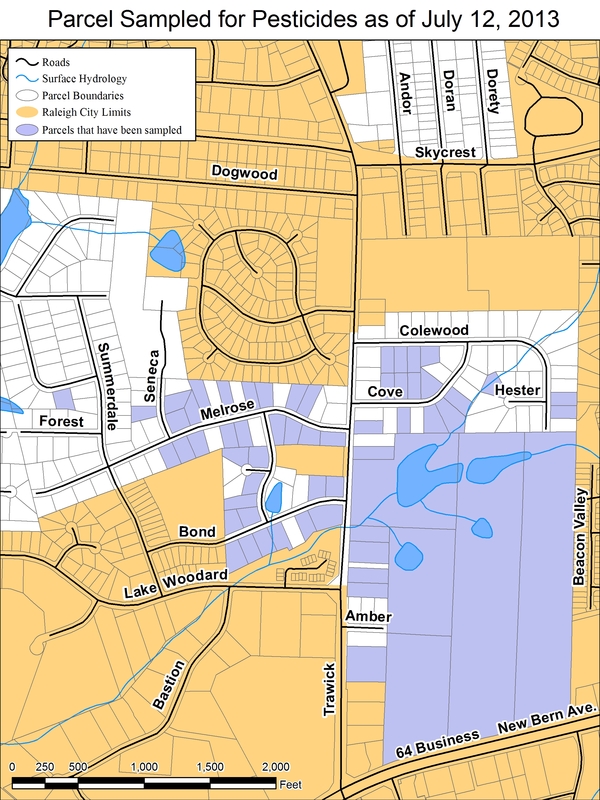 The Division of Water Quality (DWQ ) has become aware that some of the private drinking water wells near the intersection of Bond Street and Trawick Road in Raleigh, NC are contaminated with pesticides at levels that have the potential to cause health problems. DWQ is working with the Wake County Environmental Services, the U.S. Environmental Protection Agency and the Department of Health and Human Services Epidemiology Division to investigate the extent of the contamination - both in area affected and in type of chemicals - to inform residents of the potential well contamination problem and to determine the health risk to those who use their well water for drinking water and other household uses. 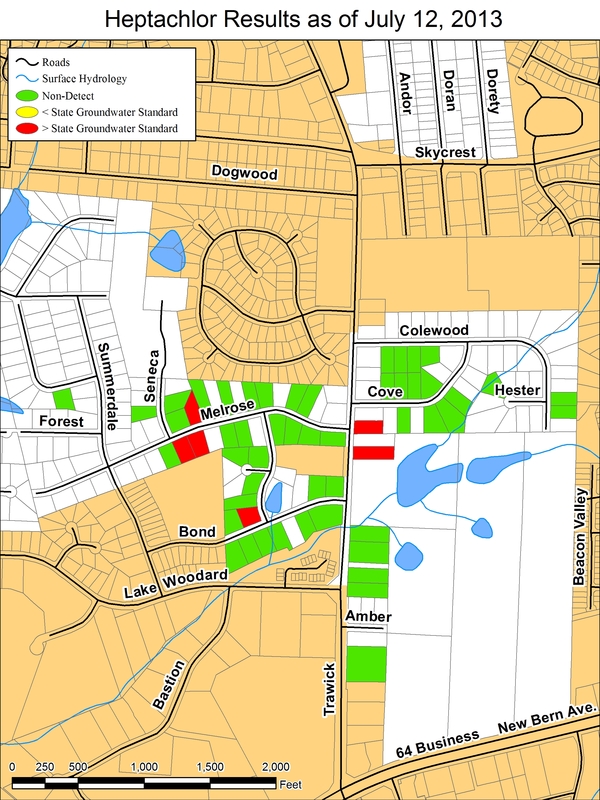 A map showing the area where the investigation is taking place and the homes whose wells have been tested as of May 24, 2013 may be found above. This map will be updated regularly as the investigation continues. For additional information, please read the Frequently Asked Questions located above, or you may call the Raleigh Regional Office at 919-791-4200, and ask for Eric Rice in the Aquifer Protection Section. What chemicals have been found? How do I know if my well is affected? Is there any cost for a water sample? Will use of the water endanger my health? What levels of the contaminants are cause for concern? What can I do to remove or filter the contaminants? Will treating the well with chlorine take care of the problem? Will installing a new well take care of the problem? What if I don't use my well for drinking water? What if I use city water or bottled water? What were the chemicals used for? How did the chemicals get to my well? How long have they been there? Who is responsible for the contamination? What is the state doing to stop the problem? 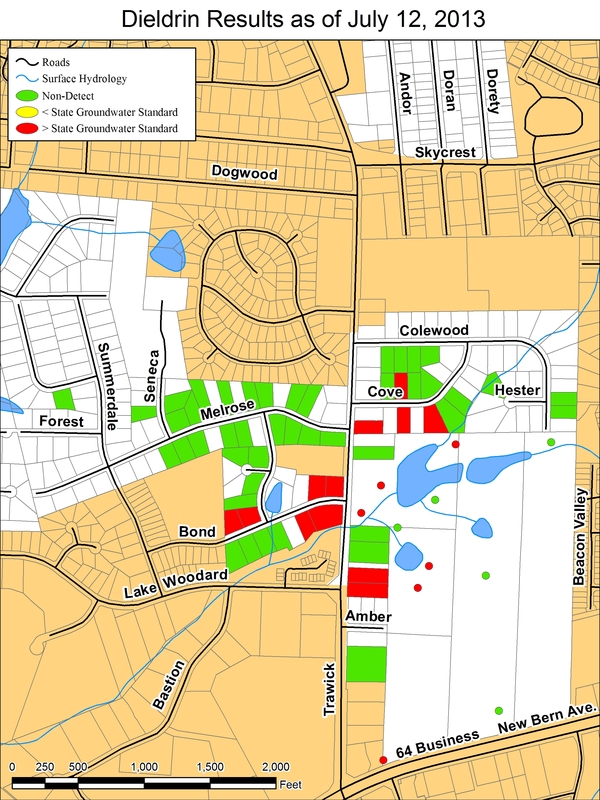 In October 2012, a resident near the intersection of Bond Street and Trawick Road in Raleigh, NC requested that Wake County Environmental Services sample his well for possible pesticide contamination. Samples taken from this well by the county and the U.S. Environmental Protection Agency contained dieldrin and chlordane, two organochloride pesticides. The county began working with USEPA and the state Department of Environment and Natural Resources to investigate the source of the contamination. At this time, the chemicals that have been found in excess of state and federal drinking water standards are the pesticides chlordane, dieldrin and heptachlor epoxide - a breakdown chemical of heptachlor. In addition, DWQ has found tetrachloroethylene, also known as perchloroethylene or PCE, a chemical solvent used in dry cleaning and as an engine degreaser. The Division of Water Quality is in the process of expanding the testing parameters to see if other chemicals of concern are present. The best way to know if your well has been impacted is to have a sample of your well water analyzed by a certified laboratory. The laboratory must be certified to test for pesticides and volatile organics. It is usually not possible to detect low concentrations of pesticides in drinking water simply by taste or odor. There is no cost to you if the Division of Water Quality determines your well should be sampled as part of this investigation. DWQ is making every effort to sample potentially affected wells as soon as possible However, if you live outside of the immediate area of investigation but are still interested in having your well sampled for chemical contamination, you may contact the Wake County Environmental Health Services Dept. (919-856-7400) or a private analytical lab that is certified to do pesticide and volatile organics analysis for assistance with sampling your well. Will the water endanger my health? What levels of the contaminants are cause for concern? If pesticides or other chemicals of concern are detected in your well, a state toxicologist will perform a health risk assessment that will describe any recommended restrictions in water use and/or consumption. The results of any health risk assessment will be given to the well owners/residents as soon as they are available. For more information about health risk evaluations or other health questions related to this investigation, please call the state Occupational and Environmental Epidemiology Branch office at: 919-707-5900. The U.S. Environmental Protection Agency recommends installing a filter containing granular activated carbon (GAC) on your water system to remove the chemicals. If your well is affected, the Division of Water Quality may recommend that you contact a professional water treatment company for advice on the most appropriate water treatment system and maintenance schedule for your particular situation. No. Chlorinating the well will not change the concentration of these chemicals in the well. Some information indicates that shallow, older and poorly constructed or failing wells that allow shallow groundwater to enter the wells are more likely to be contaminated. However, construction of a newer or deeper well will not guarantee contaminant-free water. If pesticides or other chemicals of concern are detected in your well water, a health risk assessment will be performed by a state toxicologist that will inform you of ways to limit your exposure related to activities such as bathing and irrigation. If you use city water or bottled water for drinking but well water for other usages, DWQ or the state toxicologist may still recommend use restrictions for your well water, since continued use of the well may create other risk factors or further the spread of contaminants in the groundwater. Dieldrin was used from 1950 to 1987 as an insecticide. It has been used to control termites around house foundations and other structures; flies, mosquitoes and bed bugs; insect pests in corn, cotton, fruit and vegetable crops. Dieldrin is a chemical that is formed from the breakdown of aldrin, which was also used to control insect pests. Applications were made to soils and plants. In 1972, however, the U.S. Environmental Protection Agency approved dieldrin for killing termites. Use of dieldrin to control termites continued until 1987 when it was banned. Heptachlor epoxide is a breakdown chemical of heptachlor. Heptachlor was first registered in the U.S. in 1952. It was used, primarily, as a broad spectrum insecticide on many agricultural crops and also around house foundations and other structures to control termites. It was banned in 1988, except for fire ant control in buried telephone cable, cable television pedestals and pad-mounted electric power transformers. Fire ant control with heptachlor was banned at the beginning of 2000. Chlordane was used from 1948 to 1988, primarily as a termite control around house foundations and other structures in the southern U.S. and also to control a wide variety of insect pests on many agricultural crops, lawns and gardens. From 1983 to 1988, it was restricted for use as termite control around house foundations only. The last registered use that no longer exists was to control fire ants. Perchloroethylene is a solvent used for dry cleaning, to degrease metal parts and in a few consumer products including paint strippers and spot removers. It was historically used in the manufacture of refrigerants and a wide variety of other industrial applications, including some domestic vinyl water pipes made from 1969 through 1983. How did the chemicals get into my well? How long have they been there? Pesticides could be coming from soils due to fractures in the bedrock, wells that were not properly constructed, well construction that became damaged over time, spills or an accidental back-siphoning of the pesticide into a well while mixing it with water. These chemicals were labeled for use around house foundations, other structures, and to soil and plants to control a variety of insect pests. Dieldrin, heptachlor and chlordane all bind tightly to soil particles and are very slow to break down in the environment. These pesticides can persist for a long time in soils and could be there from when they were used extensively into the 1980s. It is believed that the chemicals could be carried into groundwater by microscopic soils to which the chemicals are attached. Since these pesticides were used from the 1940s to the 1980s, it may not be possible to determine how long they have been in an affected well. Perchloroethylene is a volatile organic solvent. It is called a "sinker" meaning that it does not mix with water and is more dense than water. PCE, if poured on the ground, travels downward through soil and water, stopping when it hits an impermeable barrier, such as unfractured rock. PCE has been in use since the 1800s and persists in groundwater for long periods of time. The pesticides were used for a wide variety of agricultural and residential uses for many decades. It is possible that groundwater contamination resulted from normal use of the chemicals according to labeled directions, from heavy use around foundations or on agricultural fields, from spills or from accidental back-siphoning of the chemical into a well during mixing. Perchloroethylene has been used by industries and households since the 1800s. Determination of who is responsible will require additional investigation and sampling which may not yield conclusive results. The Division of Water Quality will be attempting to identify the responsible party or parties as part of our investigation. The Division of Water Quality is currently focused on determining the extent of the contamination and informing residents in the general area of the problem. DWQ is also working with other local, state and federal agencies to explore alternative drinking water solutions for affected homeowners.